Designed to emphasise the natural pattern of the marble finish, the Amalfi collection combines soft shapes and high-end style. Available in two shades, Pearl Grey and Sahara, with a range of table shapes and sizes. 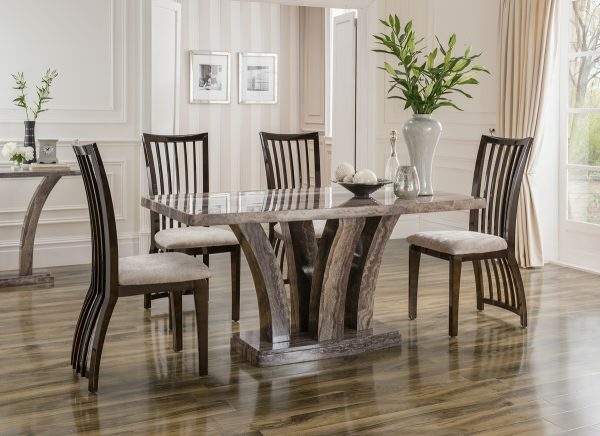 The opulent range can be complemented by Elgin or Marco chairs to form a luxurious dining set. The occasional pieces will carry this extravagant style into any living space. The Roscrea collection is manufactured from acacia wood, an Indonesian solid wood that is of superior quality. Dark acacia proclaims tradition and rustic elegance. Crafted from solid oak, the legs are finished in pale grey with a contrasting darker wood on the tabletop. This beautiful Hannah Display Cabinet is made from solid oak with a modern grey painting and traditional natural oak finished top. The Hannah Buffet and Hutch is made from solid oak with a modern grey painting and traditional natural oak finished on the top. The well proportioned Hartford Acacia collection of furniture offers an elegant yet simple range of furniture ideal for every size of living space. Designed to provide practical, yet stylish solutions to living room, hall and dining room needs. The Hartford City collection, constructed from solid oak and selected oak veneers, offers great quality at an affordable price point. Leatherette dining chair with chrome legs. Suitable for Orbit dining tables.